When we have the opportunity, it's always nice to shoot an interview in a person's home. This provides a comfortable setting as well as a visual contrast from our usual black backdrop. On the other hand, this type of interview also presents challenges. Most of the time we have to move some furniture around, and when you're pressed for time, it can be tricky remembering where to put everything back! In every case, however, we have found that narrators are gracious and generous, and while at first they might be a little taken aback when we come barging into their homes with all our equipment, inevitably they take it in stride. 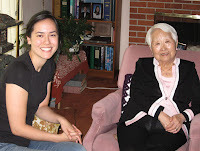 On our most recent road trip, Megan Asaka interviewed Chiyoko Yano (pictured above), a wonderful nisei who welcomed us into her home in Berkeley. On the previous day, Megan also conducted an interview with Bob Utsumi, a retired Air Force pilot. We shot this interview in Emeryville, a community sandwiched between Oakland and Berkeley. The technical challenge this time was that there was a train station across the street from the hotel, so we had to cope with the occasional train whistle!